I prefer my vegetables to be soft in this dish, so I boil the carrots until tender. I also saute the onion until it’s soft. I had some fresh green beans that I blanched and froze about a month ago, so I took those out to add in here. You can always use any assortment of frozen vegetables. I always like to have onion, carrots and something green. Peas work great, too! Melt butter in medium saucepan over medium heat and whisk in Kary’s Dry Roux. Stir for 3 minutes and add milk and chicken broth. It will take several minutes to thicken, but be patient and don’t adjust heat. Add chicken. When the mixture has thickened add in your pre-cooked vegetables and seasonings. I have great little crock bowls that I always use for this dish. 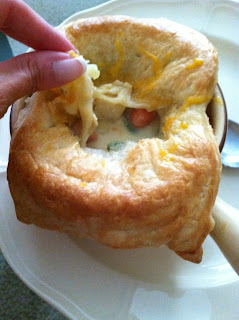 Ladle the warm pot pie mixture into small oven proof bowls. Cut an appropriately-sized square from your puff pastry sheet and set on top. Brush with egg wash and bake at 375°F until the top is golden brown (about 25 minutes). I always like to grate some cheddar cheese on top too! Do you pre-cook the chicken before adding? Will it the chicken cook thoroughly in the oven?